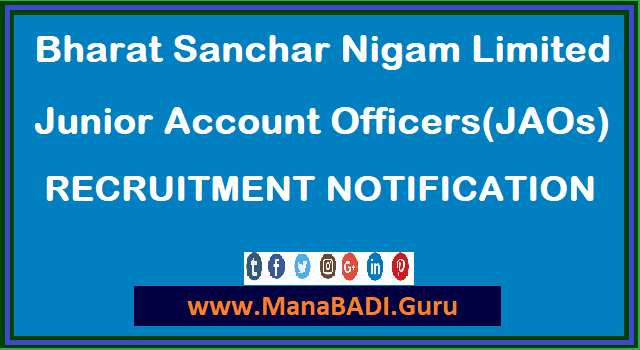 A government of India Enterprise Recruitment Section, Bharat Sanchar Nigam Limited (BSNL) Corporate office has issued a notification for recruitment of Junior Account Officers (JAOs) through open competitive examination.This recruitment examination will be held in 25 Telecom Circles in India. The BSNL invites online applications from the Only Indian Nationals for recruitment of above said posts. The Bharat Sanchar Nigam Limited (BSNL) has issued recruitment notification for the post of Junior Accounts Officers (JAOs) from open market through online competitive examinations 2017. The notification to fill up 996 vacant posts can be viewed on the BSNL’s official website. The online registration process for the exam begins on September 11 and will be closed on October 15, 2017. Interested candidates, who have the requisite qualification, need to register for the examination online by visiting www.externalexam.bsnl.co.in. Only candidates having qualification MCOM / CA / ICWA / CS from a recognised Institution/University will be able to appear in the online examination, which will be held on November 5, 2017. The JAOs will be appointed in the IDA pay scale Executive (E-1) of Rs 16,400– Rs 40,500 with annual increment and benefits as per the company rules. The JAO is a circle-based cadre and the candidates will be selected against the vacancies of a particular circle. The candidates can apply only for one circle in which he/she wants to serve. A circle wise merit list will be prepared on the basis of marks obtained by the registered candidates and available vacancies thereof in the respective circles. The selected candidates will have to execute a bond to serve in BSNL for a period of five years from the date of their appointment as JAO or a period as specified by BSNL for the post from time to time. The selected candidates will be required to successfully undergo a training. If an official does not qualify the pre-appointment training in first attempt, he/she will be given one more chance to qualify, failing which he/she will not be appointed as JAO. During the training period selected candidates will be given stipend as decided by the company. Check the notification below for more details, including eligibility criteria, examination fee, list of the BSNL circles and vacancy details, examination scheme, syllabus and much more. Note: Visit BSNL’s official recruitment website regularly for latest updates. Vacancies of BSNL JAO Recruitment 2017: According to the notification published on the official website of the public sector telecom company BSNL, they are proposing to recruit 996 posts of Junior Accounts Officer (JAO). Pay Scale of BSNL JAO Recruitment 2017: "BSNL proposes to recruit 996 posts of Junior Accounts Officer (JAO) in the IDA pay scale of 16400 - 40500/- (pre revised)," says the notification. The Junior Accounts Officer shall be appointed in the IDA pay scale of Rs. 16400-40500 with annual increment @ 3% of basic pay plus HRA, Perks, Medical Benefits etc. as admissible as per company rules. The emolument at the minimum of the pay scale will be around Rs 32,000/- approximate excluding HRA, perks, medical benefits etc. The method of selection is through an All India Competitive Examination. The application process will star from September 11. According to the schedule released by BSNL, the online competitive examination will be held on November 5 this year.